Bosch Speed Clean rotary hammer bits are Bosch’s solution to make chemical anchor installation easier and less time-consuming The general process of setting a chemical anchor correctly takes six steps – drill, blow, brush, blow, fill with chemical adhesive, and set the anchor. By using Bosch Speed Clean rotary hammer bits, you can eliminate the blow, brush, blow part of the process and reduce the amount of airborne silica dust at the same time. Let’s take a quick look at how it works. The Speed Clean bit has a more or less typical carbide tip that takes care of creating the hole, just like any other rotary hammer bit. Granted, there are styles out there with different cutter head designs that might drill faster, but they can’t do what this bit can. You’ll notice holes in the tip of the drill. If we could shrink ourselves down and walk through them, we’d find a hollow core running through the center. Near the end of the bit is a vacuum port. It allows the bit to turn while the hose stays in place. Bosch’s dust extractor hose nozzle is already a perfect fit, so it works well here. Flip your vacuum on or use the automatic tool activation setting and drill away. The Bosch Speed Clean rotary hammer bit collects the dust you create as it drills, leaving a clean hole that’s ready for your chemical and anchor installation without the extra steps of cleaning it out first. It really is, but there are some things worth addressing. I used the bit with Bosch’s VAC090A – a 150 CFM, 9-gallon unit that’s one of our go-to dust extractors, so it’s no slouch. With the vacuum on full power, you can only feel a slight pull through the bit. The holes are small and there’s only so much airflow they’ll allow. When you start to drill, there’s going to be some small concrete chips that collect around the hole, but we weren’t able to tell if there was any dust coming up. Bosch claims that the bit reduces airborne dust by 90%, so it’s a good bet that it’s at the start where the other 10% comes in to play. There’s also the potential issue of strength. Since the core of the bit is hollow, it follows that it won’t be as strong as a solid core bit. 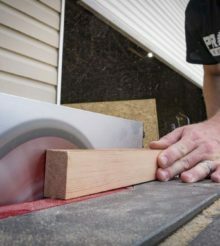 You should really let the bit and the tool do the work, but I went ahead and put some pressure on it – more than I ever do when drilling in concrete. There doesn’t seem to be much chance of damaging it, save for wearing down the tip faster and wearing myself out in the process. Even though the bit is longer than some of the ones you’re used to, it’s still more than capable of holding up in tough conditions. Is it a good solution for everyday drilling? Not really. I’d save Bosch Speed Clean bits for chemical anchor installation tasks and use standard bits for your everyday work. For one thing, you can also use a dust shroud over your hole to collect even more of the dust you create. There’s a cost consideration in that as well. A 9/16” Bulldog Xtreme 18” bit will run you roughly $20 or you can get a 12” for $14. A 15” Bosch Speed Clean bit with the same diameter will set you back $68. Clearly, it’s a specialized bit. Compared to the other options you have for hollow core bits, it’s pretty much in line with what you can expect from Milwaukee and it’s quite a bit less than Hilti. The big question today is whether or not Bosch Speed Clean rotary hammer bits are part of an OSHA Table 1 compliant solution. The short answer is yes. When you use one of these bits in your rotary hammer and connect it to a dust extractor, you’re Table 1 ready without the need for a respirator. If chemical anchor installation in concrete is on your menu, it’s worth it to keep Bosch Speed Clean rotary hammer bits on hand. It’ll save you time, which we all know is money in the construction industry. They’re also easy to use and keep you OSHA compliant for silica dust regulations. It’s tough to ask for much more than that. Awesome bits. I wished I knew about these sooner. Had to drill holes for a pressure threaded sill plate and it was hard to get all the dust out. Then I found these bits for some other holes and it was a breeze drilling and getting all the dust out. It would be nice to get them in either 1/4 or 3/8 sizes. But they are not the first. Hasn’t Hilti had this tech for years now. And with approvals for the epoxy setting part?